As much as I love all things Christmas & holiday's in general, I'm kinda tired of all the decor. I know GASP! GASP! I'm afraid it started back in Oct. Don't get me wrong, I love to see my home all decked out in it's seasonal finest but I just am kinda tired of it. I think it's going to be good that there are no more "holidays" for a while, this girl could use a break in all things decorish at least for a little while that is. Okay stepping down now, see told told you I am in a funk. Hopefully I'll be leaving funky town aka seasonal depression soon. 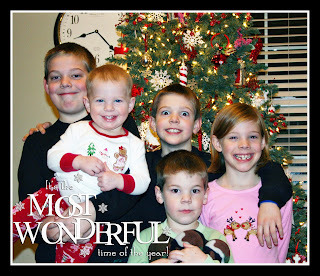 As per Christmas, we had a GREAT Christmas the kids had a wonderful time and they loved all their gifts. I'm still working on a monkey and a smallish house that I totally spaced off finishing. But Brinley has a birthday coming up in January so I'll save it for then. I captured this fabulous photo on Christmas eve and I use the term fabulous loosely. Ya gotta love Parker's EYES! Me and my camera aren't getting along lately. I know what you mean, I am debating whether or not to take down the Christmas decore, or leave it up until after the New Year. But I am going to start packing and I am in a mood where I want to just pack everything except for the needed items...so anyway, hope you guys feel better soon. I know what you mean...I just could not get into it that much this year...all the decor that is not for the reason for the season! Love your KitchenAid...I want one also...maybe sooner or later I will get one. I took all my stuff down the day after Christmas...I'm so bad! I totally get what you mean, been there too. Love seeing the kids and your a lucky duck...I need/want a kitchen aid. ♥♥♥'n the KitchenAid and I am not even the baker in our house. Our 17YO daughter is, believe it our not. But we both have always wanted one. 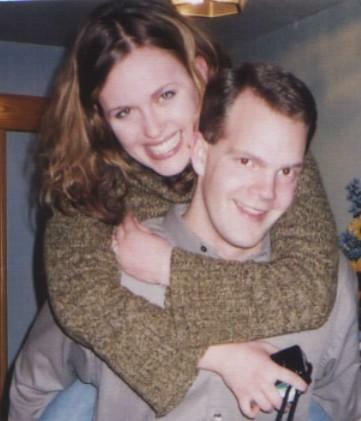 My husband and I did my her the Sunbeam version last year for Christmas but of course that's not the same thing. Kinda like apples and oranges!! As far as the Holiday decor. I am feeling the same way. But now it is just about finding the time (and energy) to take it all down!! BTW, ♥ the pic of the kids!! OKAY..word of wisdom! 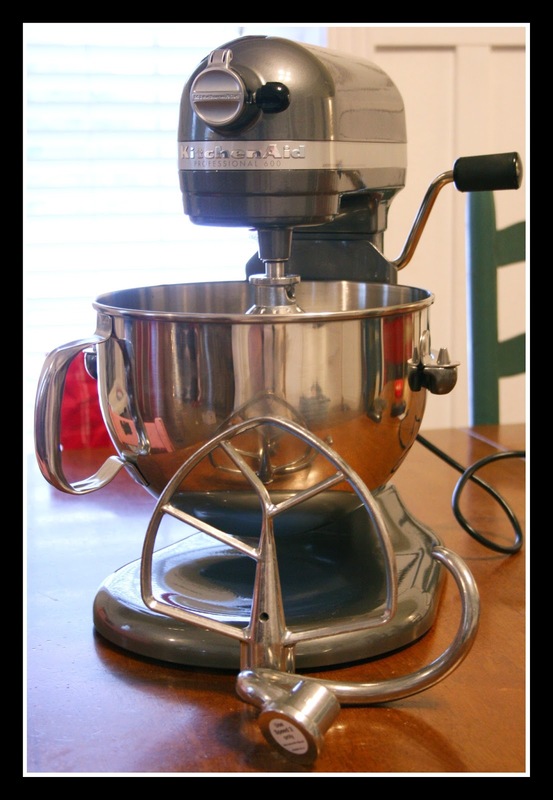 I have this mixer...after much use and a lot of sticky things..the piece that holds the "blades" came off. Kitchen Aid told me this has been reported before...so you have to be careful! But, I love mine and use it every week..it is dreamy! I think b/c we think it's restaurant "sturdy"..we really use it! Ooh you have my mixer... mama got it last Christmas for me and boy has it come in handy!!! One thing I have found is that it only likes double batches of biscotti, not triple (the huge batches, not the one I have this year on my blog). If it shuts down, just wait a few minutes and see if some dough crawled up where it connects- that's happened twice for us. I want my decorations down too and my house clean, but the little divas got sick day after Christmas and I need to conserve energy right now so I am in the same boat with that. I'm ready for a more 'simple' house too..I think it will be easier to clean. But so far, I haven't been motivated to get started. New Year's Day is my goal! Love the kitch-aid. Blessings, blessings. This chick is a droolin' over it. I am with you with the deco. and such. It just seems to be bustin' at the seams and spilling out onto everything this year. I took everything down today and am feeling like I can breathe again. Good luck with that funk! Chin up!! Its not just you- Just got off the phone with my sobbing sister- I think sometimes the holiday are even too much for "Big Girls"! Too much excitment, too much stress, just TOO MUCH! My decorations are down! The day after Christmas I chucked the tree out the door. All this snow has me funktified as well! Love your new Kitchen Aid! Here hoping you get out of the funk! Oh, I'm right there with you on the baby with an ear infection thing. Been dealing with a crier that has been awake since 5 am also. I feel your pain, Rachel, I do!! I am so lovin' your new Kitchen Aid mixer!! I love mine too, although it is just a smaller version. She serves me well!! Oh, and I have to use my little girl's birthday and Valentine's to get me out of my post-Christmas slump. Wow. Now that's a mixer. I'm with ya on the Christmas foufou. I'm done. Hope you're out of your funk soon -you've been missed. Girl, I have the funk too... I was so happy to see the tree go and do some cleaning, the needles in the carpet were starting to get on my nerves... I am ready to move forward, thank goodness Christmas is only once a year, I need to mending time to get over the hype. Christmas gets so big that I get lost in what the real reason really is... I so feel your post! Congrats on the mixer... Looking forward to more to come! Must be nice to have something under the tree on christmas morning, i wouldn't know!!! But that will end hopefully in 2 years. I am on a plan. UGH! Depression, i had anxiety issues and was even on paxil for awhile. Then once we turned alternative i found i just needed a liver cleanse. All those emotions get backed up in the liver. I haven't had a problem since and it's been 4 years. I do one every year and i've been on top of it and emotionally haven't ever felt this good! Not sure if you have a health food store to look into one or not, but i highly highly recommend one for blues that last into a depression. If you don't have a health food store, look into one online. I can give you the one i do that's at the health food store if you want. Love the xmas eve picture. I have had lack of time for blogging but finally got some things up. Hopefully christmas pix are right behind. I know how you feel about the decore! I love to put it all up but there comes a day you are ready for back to life! My problem is that I broke my foot and am ordered off of it!!! It won't get cleaned up for a while longer now..... Moving around it all on my crutches is NOT Fun! Love that kitchen aid, I too am tired of the decor, and my little dude has been waking up in the middle of the night. I can relate. Fancy Kitchen aid! nice! Do you have a bosch mixer? Those are great too!! Adison looks so much older in that picture. wow! it didn't even look like her at first. OOOOhhh, love the mixer. I have a smaller one. Love it. I'm sorry your baby is sick; you've had a time with sickness lately. Here's to a healthier 2009. Get yourself some EmergenC. Cheers, dahling. No more holidays for a while? You've got to start getting ready for Valentine's Day... just teasing! It's Sunday going on Monday and my tree is standing still but with way less ornaments. I'm not stressing out like I did before Christmas came. It sure takes the fun out of things stressing out. Great kitchen-aid mixer! They are delightful!